In a question and answer session after his speech at Ford Field in Detroit on Friday, Mitt Romney said his wife has an affection for cars produced in the United States. 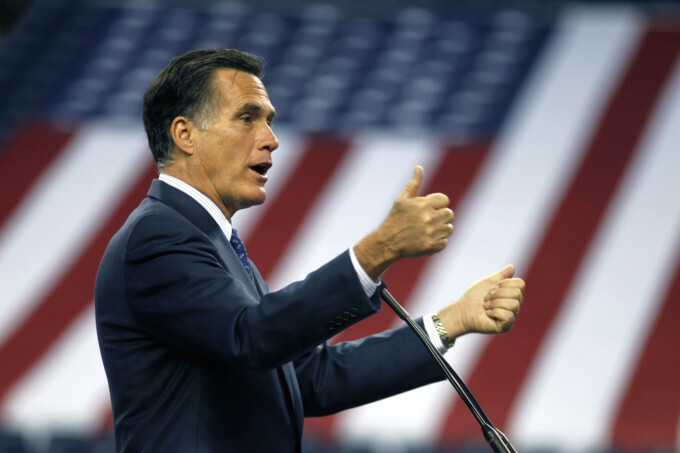 "Ann drives a couple Cadillacs, actually," Romney said. The Twitterverse--no doubt sensing motor oil in the water--lit up with tweets about the Romney family fleet. "The Romneys wake up every morning and decide which of their several Cadillacs they want to strap their dog onto,"said Comedy Central's Indecision Twitter feed in one of many tweets recalling the Romney family dog tale. "According to Twitter, Romney single-handedly bailed out GM with his Cadillac purchases," Cuffy Meh quipped. A campaign spokesman told reporters that Ann Romney has two Cadillac SRXs, one at their home in California and another in Massachusetts. Mitt, for his part, owns a Ford Mustang and a Ford truck. "Great," Stump Connolly wrote. "Maybe I can borrow one. My Maserati and Lexus are in the shop." "What Romney forgot to mention is that those couple of Cadillacs are actually just solid-gold Cadillac shells draped over BMW chassis," Chad Catacchio wrote. "If Mitt Romney's wife can afford a couple of Cadillacs, he can afford someone to follow him and tell him when to stop talking," Patrick Varas noted. "Special Adviser to the Romney campaign Rick Ross suggested Romney brag about how many Cadillacs he has," Twitter user @PourMeCoffee joked. "Next up: Maybachs." "Mitt Romney is just like Jay Leno," the Indecision feed added. "He owns several cars and no one I know likes him."